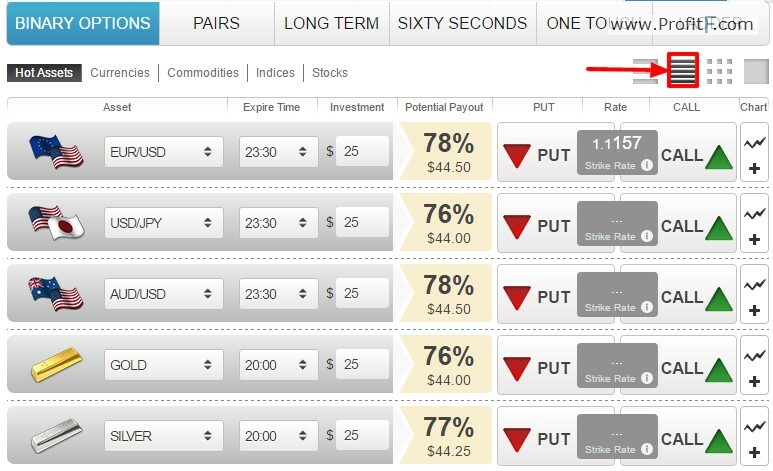 Trade Binary Options with UTrader! Struggling to make a choice from among the huge variety of binary options brokers vying for the custom of traders? While the recent competition on the market can generally only be a good thing for binary options traders, the downside is that choosing a broker from the pack can be a bit of a bewildering proposition. There are so many options that carefully evaluating them is inevitably a challenge. We’ve done our best to try and take at least some of the load off traders’ shoulders by providing the most important information you need to know on as many of the binary option brokerage options out there. In this review we cover UTrader, a well-established broker that has been on the market for several years now. UTrader’s bonus offers include cash back based on trading turnover, ‘risk free trades’, an insurance scheme that returns losses on losing binary options and education and mentoring resources based on deposit size. A good, varied package over all though higher deposits are required before traders are given many of the bonuses on offer. The SpotOption-powered trading platform is the market leader for a reason and provides for a near-flawless binary options trading environment while customer support communication channels also offer an option that will be convenient for anyone across live chat, telephone and email. 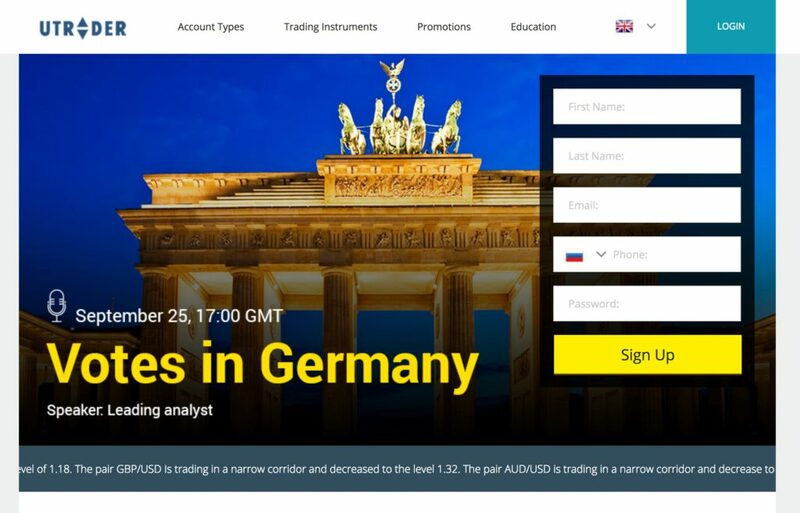 Over 250 tradable instruments available will also meet the requirements of almost all binary options traders. UTrader has been offering binary options brokerage services since 2011, making it one of the market’s longest established brokers. With its seat of operations in Latvia and registered in the Marshall Islands, UTrader claims to have over 250,000 client accounts. UTrader is fully owned and operated by Day Dream Investments Ltd., and is quickly growing in popularity in Western Europe having initially established itself as the leading binary options broker in Eastern Europe. UTrader works with SpotOption software, the biggest binary options software providers in the world and their trading platform is used by some of the biggest names in binary options brokerage. 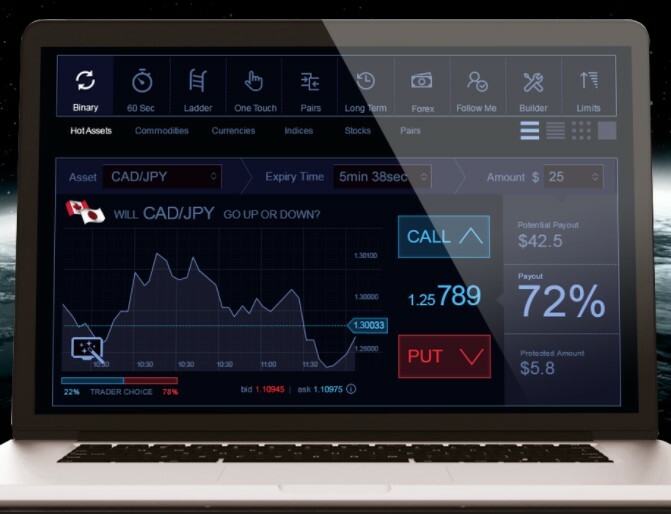 Around 40% of all binary options traders are estimated to trade via SpotOption-powered platforms, which can be considered as the binary equivalent to the forex and CFDs trading industry’s MT4 trading platform standard. The trading platform’s popularity is not a coincidence and each new update has seen improvements in usability, design, functionality, trade execution time and the control traders have over their open binary options positions. The mobile app versions of the trading platform, which come as native iOS or Android apps, is to a similarly high standard. The entire range of functionality available on the desktop version is preserved in mobile format, usability is wonderfully intuitive and considering what the app does its impact on battery life is impressively efficient. Importantly, trade execution times show almost no lag when compared to trading with the desktop platform. UTrader clients have an impressive range of over 250 different instruments to trade across forex, cryptocurrencies, commodities, indices and individual equities. The range of cryptocurrency trading options is particularly broad and will be a special draw for crypto-enthusiasts. As traders already familiar with the SpotOption trading software will be aware, the innovative ‘Pairs’ instruments add further depth to the assets index. Pairs match up related instruments such as the DAX 30 and CAC 40 or Apple and Samsung in the way forex pairs are formed. The binary option is then based on which instrument of the pair will perform better or worse than the other. UTrader’s platform offers 5 different varieties of binary option. In classic binary options, the expiry time is usually chosen between options provided by the broker of between 30 minutes and the end of the trading day. The trader predicts if their chosen instrument’s price will be up or down on its starting level by the expiry point. 60 Second and Long Term binary option formats work in exactly the same way but with a micro expiry time of one minute in the case of the former and a much longer expiry time of anywhere between a few days and a year in the case of the latter. Long Term binaries will appeal to traders who don’t enjoy technical analysis and prefer to look at the fundamentals that impact an instrument’s intrinsic value, which play out over a longer period than usual binary option expiries allow to be factored in. 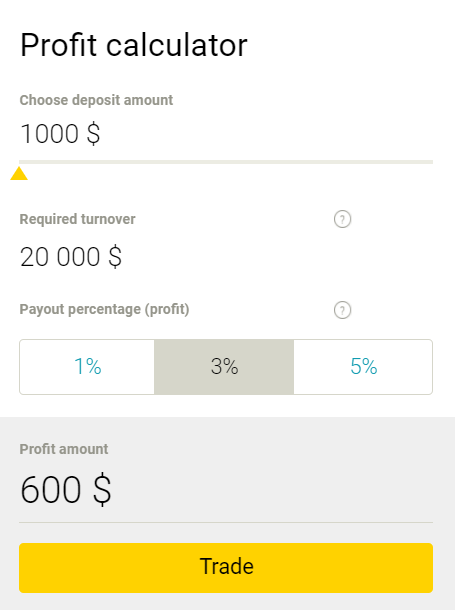 The One Touch format differs from classic binaries in that while the option still has an expiry time, it will only reach it if the option finishes out of the money. The option finishes in the money if it ‘touches’ its strike price at any point prior to its expiry. Finally, ladder options have staged strike prices which are ‘laddered’ up or down depending upon if the binary option is long or short. A payout is realised if the instrument’s price on expiry has at least reached the lowest rung on the ladder but increases in value the further up or down the price ladder it has gone. Payouts standardly reach up to 85% but can reach up to 1000% on Ladder options and Pairs can offer up to 250% payouts on riskier positions. Fees include an ‘inactive account’ charge of $/£/€25 if no transactions have been made from an account in at least 30 days. Withdrawals made by wire transfer are subject to a $/£/€25 charge. One withdrawal per month requested via e-payment processor or debit card is free with additional withdrawals then charged at $/£/€12. The bonus program offered by UTrader is diverse. New traders who have opened an account are given ‘Risk Free Trades’, the number of which varies on deposit size, up to a maximum of 5 and a maximum value of $/£/€500. This ‘insurance’ bonus means that traders are refunded the investment stake of a losing trade. Cashback bonuses of up to 5% on trade turnover are also awarded. As well as the relatively standard range of £, $ and € account base currencies, UTrader also supports trading accounts denominated in Russian roubles and Polish zloty. Deposits and withdrawals can be made via debit and credit cards or e-payment processors though bank and wire transfers and not yet supported. $200, or the equivalent in one of the other base currencies supported is the minimum deposit with the minimum withdrawal value set at $25. Customer support is provided via online chat, Skype, telephone or email and agents speak English, German, Russian and Polish. A popular tool available on UTrader is the ‘strategy advisor’. This allows traders to request price movement predictions on selected instruments based on any combination of three common technical indicators (Moving Average, RSI and Bollinger Bands). A social trading setting that allows traders to copy or mirror binary option trades of the platform’s most successful traders is also a nice value-added feature UTrader’s clients can take advantage of. UTrader offers a great trading platform, having opted for SpotOption’s software and is a well-established broker with 6 years of history. The range of tradable instruments is more than sufficient and a host of nice features give traders great choice and control. While UTrader is not yet regulated the broker has a strong reputation in Eastern Europe and is now working hard to make inroads in the Western European market. 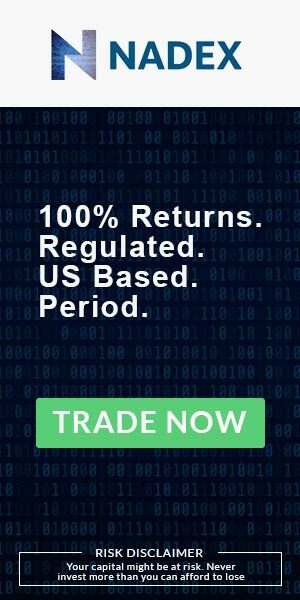 Is UTrader a safe broker? UTrader is not regulated but has been around since 2011 and is popular with its traders suggesting that despite not being regulated the broker operates in an ethical manner. What is the minimum deposit required to open a UTrader account? $200 or the equivalent in £, €, Russian roubles or Polish zloty. What is the minimum investment stake to trade with UTrader? $20 or the equivalent in £, €, Russian roubles or Polish zloty is the minimum investment size. Yes, several cryptocurrency-based instruments are available.